Description: Chicago Burlington & Quincy Railroad 4-8-4 Class O-5 5601 presumed at Philadelphia, Pennsylvania on an unknown day in September 1930, photograph by Baldwin Locomotive Works, print by H. L. Broadbelt, Chuck Zeiler collection. Number 5601 (c/n 61444) was one of eight Baldwin 4-8-4's built in 1930, the Q's first Northerns, road numbers 5600-5607. They were fitted with Elesco feedwater heaters. More 4-8-4's were built by the CB&Q using Baldwin boilers (#'s 5608-5635) and the home-built locomotives were fitted with Worthington feedwater heaters. There's a couple of interesting automobiles in the left of the frame. Description: Chicago Burlington & Quincy Railroad 4-8-4 Class O-5 5601 presumed at Philadelphia, Pennsylvania on an unknown day in September 1930, photograph by Baldwin Locomotive Works, print by H. L. Broadbelt, Chuck Zeiler collection. Number 5601 (c/n 61444) was one of eight Baldwin 4-8-4's built in 1930, the Q's first Northerns, road numbers 5600-5607. They were fitted with Elesco feedwater heaters. More 4-8-4's were built by the CB&Q using Baldwin boilers (#'s 5608-5635) and the home-built locomotives were fitted with Worthington feedwater heaters. Description: Chicago Burlington & Quincy Railroad 4-8-4 Class O-5 5601 presumed at Philadelphia, Pennsylvania on an unknown day in September 1930, photograph by Baldwin Locomotive Works, print by H. L. Broadbelt, Chuck Zeiler collection. Number 5601 was retired in May 1961 and sold for scrap. Description: Chicago Burlington & Quincy Railroad 4-8-4 Class O-5 5601 at Clyde, Illinois on October 18, 1953, photographer unknown, print by Tom Klinger, Chuck Zeiler collection. Number 5601 ( c/n 61444 completed September 1930 ) was one of eight Baldwin 4-8-4 types built in 1930, the Q's first Northerns, road numbers 5600-5607. They were fitted with Elesco feedwater heaters. More 4-8-4's were built by the CB&Q using Baldwin boilers ( #'s 5608-5635 ) and the home-built locomotives were fitted with Worthington feedwater heaters. Description: Chicago Burlington & Quincy Railroad 4-8-4 Class O-5 5601 at Lincoln, Nebraska on November 11, 1955, photographer unknown, print by Don Gruber, Chuck Zeiler collection. Number 5601 ( c/n 61444 completed September 1930 ) was one of eight Baldwin 4-8-4 types built in 1930, the Q's first Northerns, road numbers 5600-5607. They were fitted with Elesco feedwater heaters. 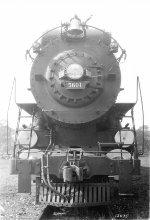 More 4-8-4's were built by the CB&Q using Baldwin boilers ( #'s 5608-5635 ) and the home-built locomotives were fitted with Worthington feedwater heaters.